First up, I want to apologise for the lack of posts recently. I have been acting in a new position at work, and various other personal reasons have left me a little drained or busy. I am going to be aiming at a 2-posts a week regime from now on, but can’t promise anything. Secondly, I would like to apologise for the mobile phone photography on this one, however my Brother-in-law is a new dad (Congrats Leigh! ), and borrowed my camera. Anyway, to the review! 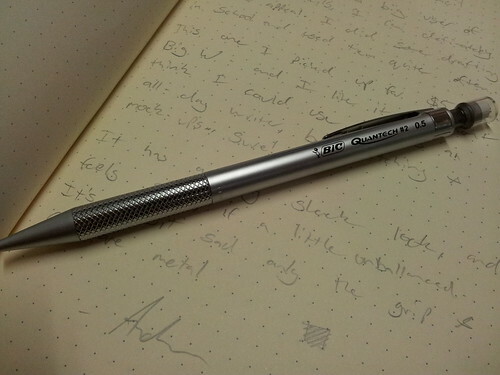 I picked this pencil up a few weeks ago because I hadn’t reviewed a Mechanical Pencil (or Pacer, as I knew them in school) on the blog yet, and this new one from Bic looked quite impressive. The kit comes with the pencil, which has three leads inside it and a neat little holder which has 12 spare leads and 5 spare erasers within. This is plenty to keep you going for a while. 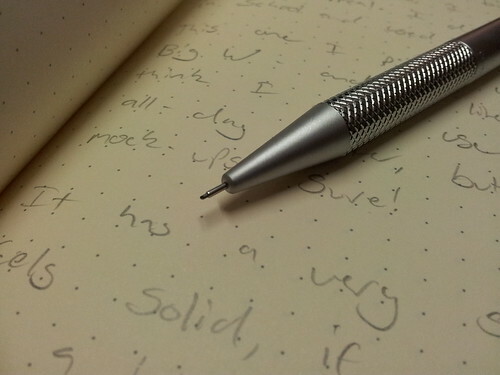 The pencil itself writes well, and feels quite solid in your hand. I noticed the balance seemed a little off, as the body was made of a hard plastic, but the grip was made of (what I am guessing is) stainless steel. This makes it a little “nose-heavy”. I imagine that that could be a good thing if you were drafting or technical drawing, as it keeps the point firmly on the paper. The lead performed as expected. From my experience with mechanical pencils, the writing implement makes less of a difference than the grade and quality of the lead. 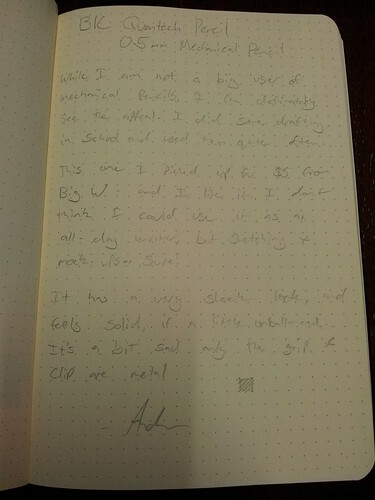 I was fairly pleased with this 0.5mm offering on my Rhodia DotWebbie. The rest of the pen is quite well made. The metal tip slides back into the body to make it easier to pocket the pencil, however I did notice that was rather difficult to do. It required a number of presses and pushes. The eraser is acceptable. I did a little test down the bottom, and while it didn’t smudge, the writing was still visible. The small included erasers with mechanical pencils will never stack up to a specifically designed independent eraser. 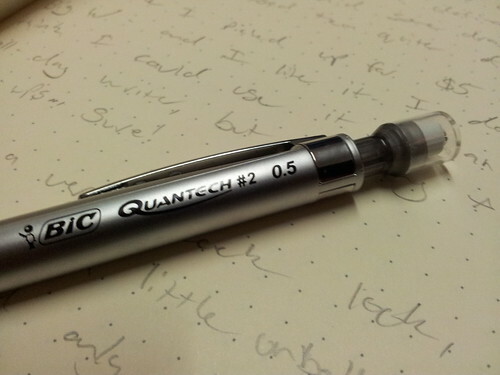 Over all I am quite happy with my Quantech Pencil. 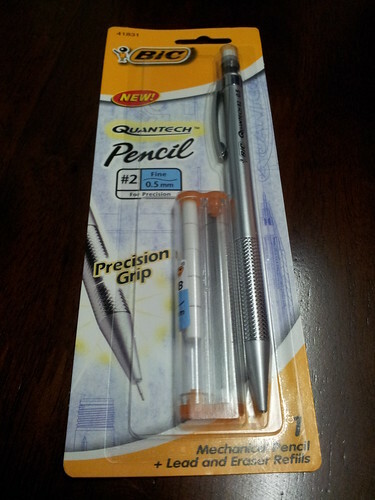 I will keep it handy for whenever I need to do some quick sketches or diagrams, and don’t want the permanency of pens. I have this! It’s survived longer than most of my stationary and the extra lead and erasers have kept it going strong. Hands down my favourite pacer. I bought one of these pencils too, and at first it was all good. Nice feel and neat to write with, that is until it needed to be refilled – then the trouble started. It is now in bits waiting to be consigned to the bin. and find it impossible – I’ve fiddled with it over an over and unsuccessful. assured if it’s not replaced by the Company, I’ll never buy another. All the pieces are neatly packed in a plastic bag, never to be opened again – actually tossed out is the route I plan to take. Got it, thanks to the chap at OfficeWorks. Take the plastic cover off the eraser at the top of the pencil. Then wiggle the eraser out of its seat. Then you will find a hole going down the centre of the pencil, under where the eraser was. Drop a couple of leads into there, put the eraser back in, put the eraser cover on and Bob’s your Uncle. Far out! Thank you Leni (and Office Works). Should’ve googled the problem months ago before wasting numerous leads and several visits to different stationers. Are you guys stupid?? Almost every mechanical pencil ever is refilled by popping up the eraser. How can you not know? What the frick did you try countless times other than pulluing the eraser? Anyways, just wanted to add, I bought one of these while ago. The palstic cap on the eraser broke in half on the first drop, and the plastic holding the eraser and lead shattered, probably all the way down. The pencil still works like a charm and I’ve been using it for well over a year since then. Just has a crack that you can see going to the inside.